Girls from Ukhta State Technical University’s dance club «Nargiz» introduce the Middle Eastern vibe. Middle Eastern dance caught on at the university thanks to the enthusiasm of its founder, Eltsova Lyudmila, the first Head of «Nargiza». Since 2009, middle eastern dance ensemble is being led by Natalia Varfolomeeva and Carolina Yakumayte, who have earned many certificates among which is a document that confirms their right to teach Middle Eastern Dance. Ensemble «Nargiz» is well-known and warmly received not only in Ukhta and Komi Republic, but also well beyond their home region. 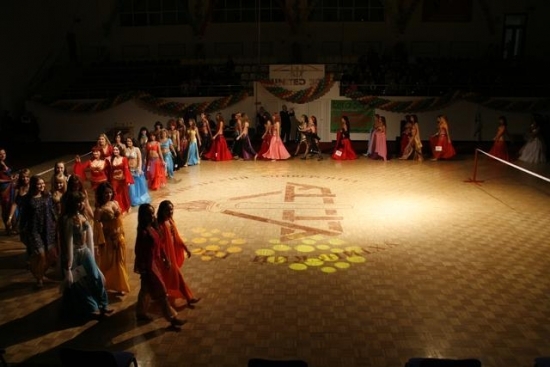 The team successfuly performs at international festivals and competitions. For example, in November 2012, in St. Petersburg, at the prestigious International Festival of Oriental Dance «Al Salam», “Nargiz” dominated its competition in six nominations without leaving the opponents a chance to win.